Nigel Pearson and his Leicester team lost 3-1 at home to soon-to-be Premier League champions Chelsea on Wednesday evening. There’s no shame in getting beaten by Mourinho’s team. They’re head and shoulders above the rest. 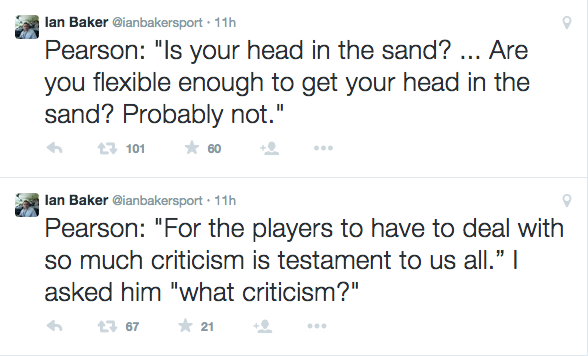 It didn’t stop Pearson from losing his rag at a local journalist though. Again. During the post-match press conference, journo Ian Baker set Pearson off with what was described as a ‘stupid’ and ‘silly’ question before the Foxes boss then said “you are an Ostrich” before ranting some more and then storming out, refusing to take any more questions. Chill out, Nige. Next: Next post: Watch: Icelandic Mud Football, anyone?